1 Free SweeTARTS Chewy Cherry Punch Rope Candy (1.8 oz.) in Kroger stores, with coupon. This Kroger Free Friday Coupon is available for download on Friday, February 8, 2019 but you have until February 24, 2019 to redeem it. What is SweeTARTS Chewy Cherry Punch Rope Candy? SweeTARTS Chewy Cherry Punch Rope Candy are the colorful candy creations in a bendable fun form. Ingredients: Sugar, Corn Syrup, Wheat Flour, and Less Than 2% of Water, Citric Acid, Sorbitol, Confectioner’s Glaze (Lac-Resin), Maltodextrin, Sodium Citrate, Glycerin, Malic Acid, Gelatin, Vegetable Juice Color, Natural Flavors, Salt, Beta-Carotene Color. 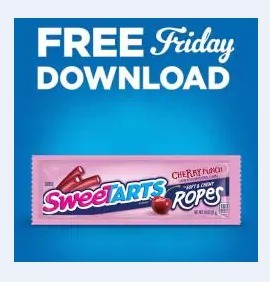 Redeem your coupon in-store within 2 weeks for 1 free SweeTARTS Chewy Cherry Punch Rope Candy (1.8 oz.). Your coupon will automatically be applied at checkout when you use your Shopper’s Card. Available in most stores.